Skatepark donors and supporters from left to right: Tiffany Tauscheck, Greater DM Partnership; John Ruan IV, Bankers Trust/Ruan Foundation; Kristi Knous, Community Foundation of Greater DM; Angela Defleths-Trettin, Community Foundation of Greater DM; Dan Kramer, SHAZAM; Mark Oman, Community Foundation of Greater DM Leadership Circle, Honorary Chair; Jill Oman, Community Foundation of Greater DM Leadership Circle, Honorary Chair; Brad Anderson, Skatepark Campaign Co-chair; Angela Connolly, Polk County Supervisor & Skatepark Campaign Co-chair; Carl Voss, Donor & Skatepark Cabinet Member; Virginia & Nix Lauridsen, Leadership Gift Donors; Jann Freed, Donor & Skatepark Cabinet Member; Christine Hensley, Skatepark Campaign Co-chair; Marta Codina, Wells Fargo; Steve Heston, SHAZAM; Jan Hill, Donor & Skatepark Cabinet Member; Gerry Neugent, Knapp Properties; Steve Van Oort, Polk County Supervisor. The Des Moines Regional Skatepark would not be possible without the generous financial support from so many members of our community. 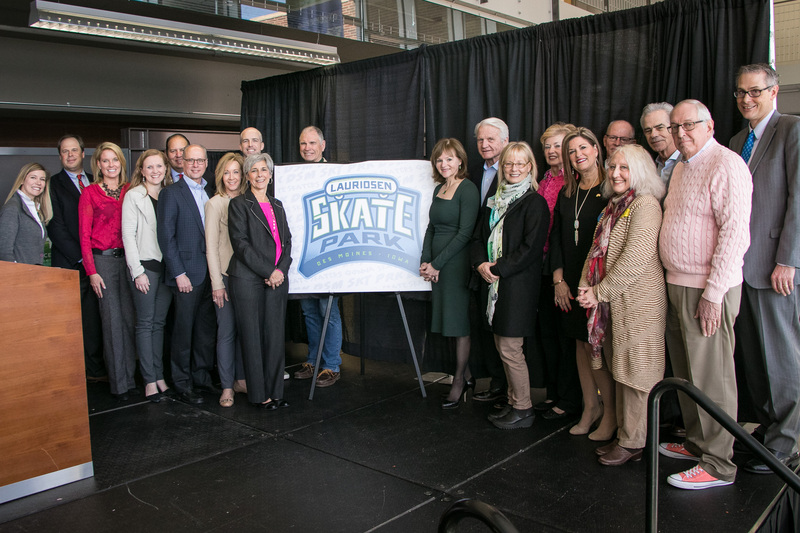 Individuals, corporations, foundations and nonprofit organizations have come together to bring this world-class skatepark to Des Moines. Des Moines Skatepark shared a post.